The Mediatrix-LP Series is the leading ATA when deploying cloud telephony services for demanding wiring conditions and over-voltage exposure applications. It provides secondary over-voltage protection and enhanced power feeding to meet requirements for large buildings as well as outdoor environments. What's the difference between the Mediatrix S7 and S7 - LP Series? The Mediatrix S7 Series VoIP Adaptor contains outstanding voice quality and mass management that enables users to connect all analog equipment to a hosted or on-premise IP-PBX. The Mediatrix S7-LP Series is the industry leading VoIP Adaptor (ATA) for deploying cloud telephony services for regions and cabling with over-voltage exposure. 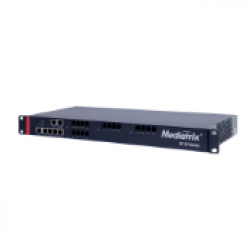 The Mediatrix S7 Series of analog VoIP adaptors (ATAs) offers the ability to smoothly connect all IP and legacy equipment to a hosted or on premise IP-PBX.